The Venetian glass industry enjoyed a golden age during the Renaissance. By the early 1500s, the wonders of Venetian glass were well known throughout Western Europe. Not well known, however, was how these objects were made. Until now. 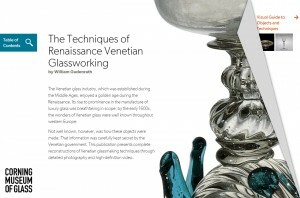 The culmination of a lifetime of research by artist and scholar William Gudenrath, The Techniques of Renaissance Venetian Glassworking (http://renvenetian.cmog.org) presents 35 complete reconstructions of Venetian glassmaking techniques through detailed 360˚ photography and high-definition video. 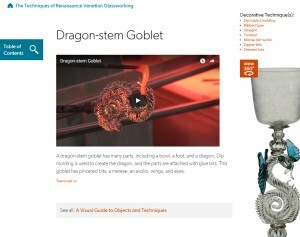 The most significant contribution to this scholarship is the “Visual Guide to Objects and Techniques.” In the guide, Gudenrath narrates demonstration videos illustrating the recreation of 25 key objects from The Corning Museum of Glass collection, as well as 10 additional techniques in brief. The videos are embedded from the Museum’s popular YouTube channel, where they can be accessed by students looking for tutorials typical of the platform. 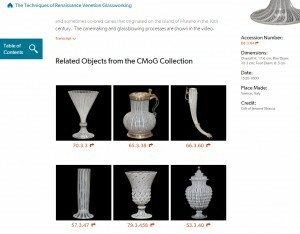 Users can zoom and rotate the object see every detail in 360˚ photos of the historical objects. 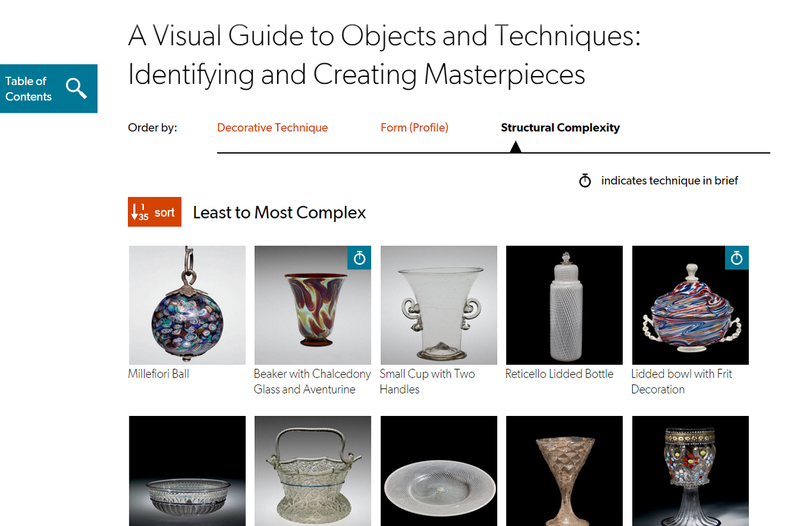 Also included are related objects from the Museum’s collections browser. 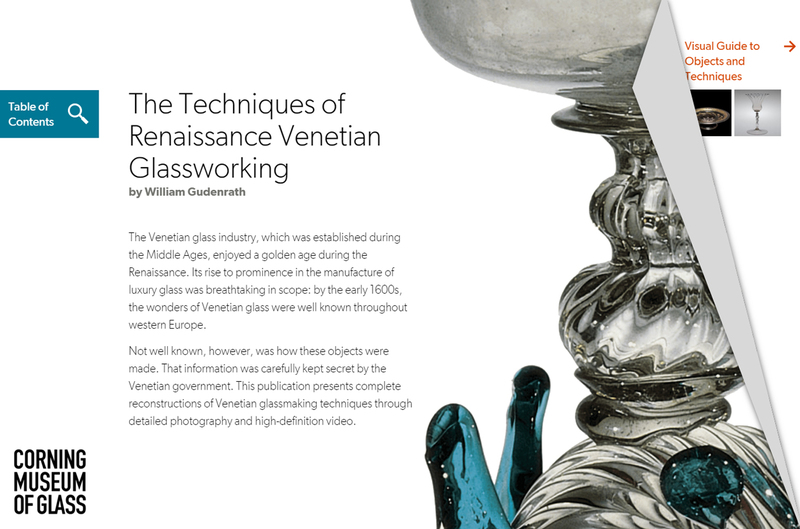 The resource includes a thoroughly researched text that begins with developments in glassblowing before its arrival in Venice, a historical overview of glassmaking in Venice, and “A Look Inside a Renaissance Venetian Glasshouse,” which is the next best thing to actually stepping back in time and seeing how the Venetian masters worked. Throughout the text Gudenrath references techniques and presents narrated videos in line in the chapter text. Also included are paintings, wood carvings, and other drawings, digitized from the Museum’s Rakow Library archive, as well as over 70 high-resolution photo figures to accompany the text. The free online resource is full of rich content meant to inform scholars, inspire artists, and captivate a curious public. All content is licensed under a Creative Commons Attribution-NonCommercial-ShareAlike 4.0 International License. Each page has links to generate a citation, or share to a social media channel. The resource was built in Drupal, and is fully responsive—accessible to read on a laptop, or to pull up a video on a phone for reference while glassblowing in the hot shop. The design includes accessible high-contrast colors and fonts that respond well to resizing. All videos in the resource are closed captioned and transcripts of the narration are available on the object pages. For researchers, students, and collectors of Renaissance Venetian glass, there is no better resource available on this topic. Users can sort objects in the Visual Guide by decorative technique, form, or structural complexity. Watch a narrated demonstration (with closed captioning and transcription) see 360-degree photos, and browse other objects made using the same technique. Rotate the 360-degree images to see every side of the historical objects. 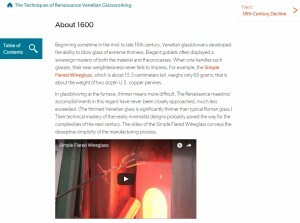 In A Historical Overview of Glassblowing in Venice, embedded videos show objects and techniques mentioned in the text. 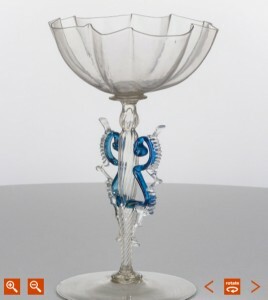 See objects in the Corning Museum collection made using the same glassworking techniques. 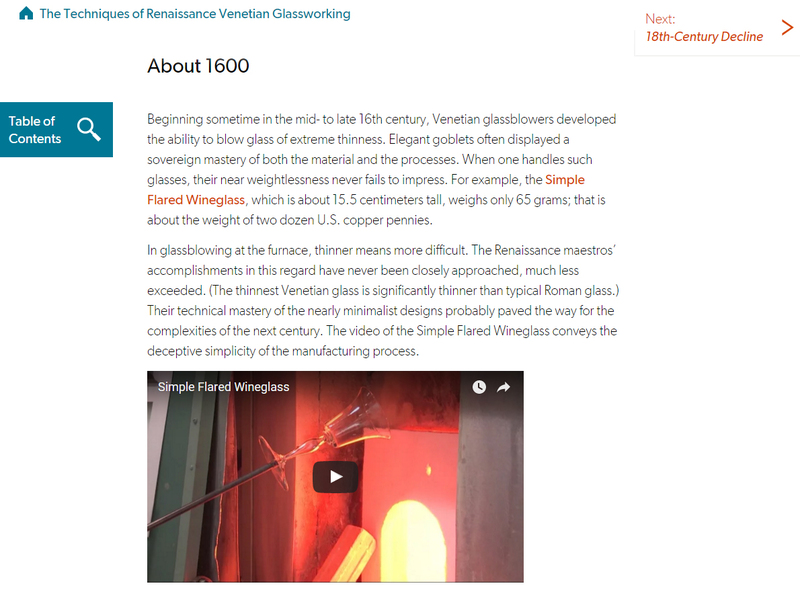 The Techniques of Renaissance Venetian Glassworking is the first-ever scholarly electronic resource produced by The Corning Museum of Glass. This project was realized through funding from the Kress Foundation, and was a cross-team effort between Gudenrath, and the Museum’s Studio, publications, A/V, photography, registration, and digital media teams.